For over a year now, the U.S. dollar has experienced a steady, continuous decline in value. It’s partly because that’s the stated desire of many within the White House, who may very well be playing a shell game of sorts. You see, right now, the U.S. economy is projecting several signs of strength — at least according to many mainstream metrics. But this “shell game misdirect” might be coming at the expense of the dollar. 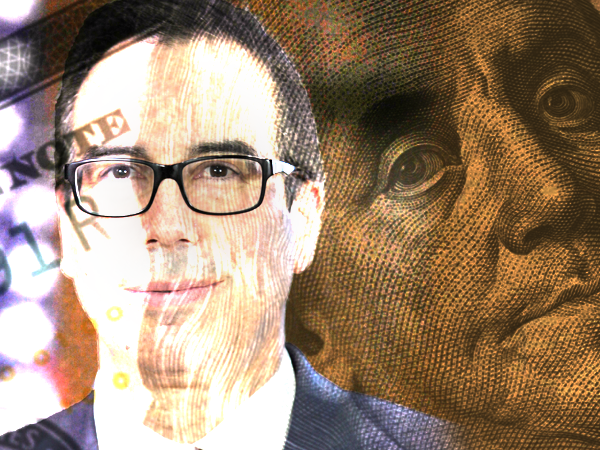 Treasury Secretary Steven Mnuchin has even endorsed the dollar’s recent decline, going so far as to essentially say that it’s part of the plan. That’s because, as he sees it, a weaker dollar would benefit the American economy, as it will be beneficial for trade opportunities. It’s part of the Trump Administration’s plan to focus on “America First” exporters and propose a more anti-global trade initiative. With that in mind, it would be wise for you to keep an eye on the movements of the dollar. In a previous article we showed how tighter trade policies could speed up the dollar’s demise. The result of those policies is now starting to play out. … it is a hidden tax on people who are holding dollar-denominated assets and a benefit to those who have dollar-denominated liabilities. … rebalancings should be expected over time, especially when U.S. dollar bonds look unattractive and trade tensions with dollar creditors intensify. That correction could be starting now…. On January 10, China announced that they are now viewing U.S. Treasuries as less attractive, saying that they may start to slow purchase, if not halt them altogether. Further, for over the past year, the dollar has taken a major hit. And then the Fed raised rates this past December, contributing to the dollar starting this year off in the worst state since 2003, with the Dollar index down 2.43%. The index also dropped below 90 for the first time since 2014, and isn’t showing signs of recovering since the Fed rate hike. “While at this stage Trump’s protectionist rhetoric is being applied sparingly and not drawing a reaction from China, there is the threat of Trump ramping up protectionism,” said David Forrester. If things keep going as they have, this “hidden tax” from a weakening dollar could be hedged by moving some assets into precious metals like gold. Gold has been on a sharp rise as of late, rising from $1,248 last December to its current level around $1,350. That trend seems to be following right along with the big hit the dollar has taken since. Precious metals are historically proven to appreciate in value whenever the dollar falls. Plus, they can offer you protection against adverse events like the real possibility of the dollar crashing this year. When it finally happens, you can expect reactive buyers to begin snatching up metals fast, which instantly drives up prices. That trend could be starting right now, so don’t wait for the dollar to crash before protecting your wealth with precious metals.